354 TASSIN, N. Carte de Provence. Paris, 1634. Beau col. ancien. Belle impression, bien contrast�e. 370 x 518 mm. � Rare en coloris d'�poque. Premi�re �dition. Very beautiful and detailed map of Provence. Beautiful wind rose, scale cartouche and title cartouche affecting the form of a sea monster. Several sailing ships and a sea monster. 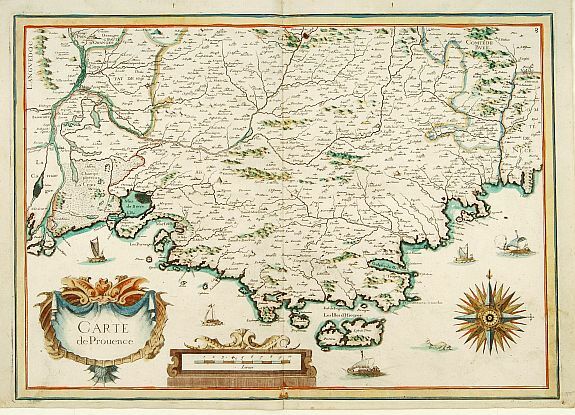 Nicolas Tassin, who was active from 1633 till 1655, was appointed "royal cartographer" at Dijon before setting up as an engraver in Paris where he issued various collections of small maps and plans of France, Switzerland, Germany and Spain. Maps by Tassin in original colours are rare. With a plate number 8, in upper right corner. 357 GILETTA. Panorama de Nice. Nice, ca. 1890. Col. Bon �tat. 215 x 565 mm. Photographie de la Promenade des Anglais et de l'ancien casino sur la jet�e.